مراجعة ليلة الامتحان رائعة بالاجابات اللغة الانجليزية,الصف الثالث الاعدادى. حمل مراجعة نصف العام النهائية فى اللغة الانجليزية الصف الثالث الاعدادى ترم اول .مراجعة ليلة الامتحان فى اللغة الانجليزية , مراجعة رائعة بالاجابات,الصف الثالث الاعدادى,الترم الاول ,حمل من خلال موقعنا مراجعة ليلة الامتحان الشهادة الاعدادية فى جميع المواد ,امتحانات مادة لغة انجليزية , لغة عربية , دراسات , علوم ,رياضيات , حمل كل المواد ,ابتدائى واعدادى,ثانوى الترم الاول والترم الثانى. راجع معنا اونلاين ,مراجعة ليلة الامتحان فى اللغة الانجليزية , مراجعة رائعة بالاجابات,الصف الثالث الاعدادى,الترم الاول . المذكرة من اعداد ورفع مستر‏‎Mahmoud Ramadan‎‏. 1- Soha and Maher are talking about sports. Maher : What’s your favourite sport, Soha? Soha : I play it once a week, in the club near our house……………...(3)…………………….. ? Maher : I prefer football. It’s a very exciting sport. 2- Hani meets his friend, Amir in the street. Hani : Good morning, Amir. I see you’re in a hurry.…………. …(1)…………………… ? Amir : Good morning, Hani. I’m going to Hope Hospital. Amir : To visit my uncle who was injured in a car accident. Hani : Could I go with you, Amir? Amir : …………..(3)………… . That’s very kind of you. 3- Samy needs to do some work on the internet, so he asks his father to buy him a computer. Samy : Would you buy me a computer, please, Dad? Samy : I need to do some work on the Internet. Father : Do you know how to use the Internet? Samy : ………….(2)…………. .We use computers at school. Father : OK. Tomorrow. ……………(3)……………….. .
1- Your friend introduces his cousin to you. How do you do? Or Pleased to meet you. 2- You meet your uncle in the evening. 3- You want to use your friend's camera. Can I use your camera, please? Or Do you mind if I use your camera? 4- You request your sister to make you a cup of tea. Could you make me a cup of tea? Or Do you mind making me a cup of tea? 5- Your friend wants to borrow your dictionary. You agree. Yes, of course. Or Here you are. 6- Your friend wants to take your ruler. You need it. 7- You suggest your friend to go to the club. Let's go to the club. Or What about going to the club? 8- Someone suggests playing football and it's very hot. I'm not very keen . 9- You are thirsty and your friend suggests having a cool drink. 11- Your friend told you she's just had a baby. 12- Your brother passed his class tests. 13- Your brother broke his leg in an accident. 14- You broke your friend's glasses. 15- Your sister has broken your cup. You are not angry. Never mind. Or No problem . 16- Your brother apologized for losing your book.You don't accept the apology. It was new . You must buy a new one . 17- You advise your friend to study hard . 18- Your friend doesn't come to school early. You advise him. If I were you, I would come to school early . 19- You've decided to go to Aswan next month. Tell your friend. I'm going to travel to Aswan next month. 20- You want to tell your friend that it was your habit to play tennis, but no it isn't. I used to play tennis . 21- You ask a tourist how long he's going to stay in Egypt. How long are you going to stay in Egypt? 22- You want to ask about your friend's health because he has been ill.
23- Your friend wants to know your opinion about the match you watched. In my opinion, the match is very interesting. 24- You offer to open the door for your mother. 25- You request politely from your sister to make you a sandwich. Can you make me a sandwich, please? 26- You suggest going to the cinema with a friend on Friday. What about going to the cinema on Friday? 27- Your friend has lost his school books and he asks you for advice. You should ask you friends about them. 28- You want to tell your brother about your opinion on people who throw rubbish in the streets. I think they are careless people. 29- You meet someone for the first time. 30- One of your friends received a prize in drawing. 31- You apologise to your teacher for coming to school late. I’m sorry for coming late. 32- A friend requests you to give him/her some money, but you refuse his/her request politely. I’m sorry I need it . 33- Your cousin wants to borrow your camera and you agree. No, I don’t mind. No, not at all. 35- Your brother apologises for losing your CD. Accept the apology. 36- A friend of yours wants to know your opinion about the educational programmes on TV. I think they are very useful . Do you mind if I borrow your dictionary ? Is it OK if I go to the shops with you, Dad ? What about watching the match at the coffee shop ? Why don't we spend the weekend with our uncle at the farm ? I (must) apologise for spilling juice on your new carpet. You'd better not practise hard today. You seem tired.  I have been doing my homework for two years. 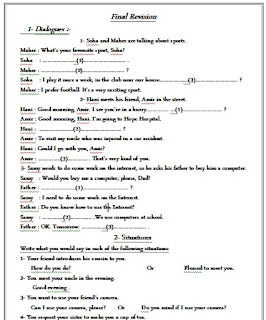  Mona is going to do her homework after washing the dishes.  I'm hot and thirsty. I will have a cool drink.  My uncle has been overseas for seven years.  I haven't finished reading the book,yet.  Nadia used to be a very bad driver.  Despite carrying a heavy bag, he helped the old man cross the street.  He came early, but he missed the bus.  Our team played well. However, they lost the match.  Ashraf is learning Japanese to travel to Japan.  If I hadn't arrived late, the teacher wouldn't have been angry.  If he had been confident, he would have done well in the exams.  After we had finished our homework, we played computer games.  By the time the doctor arrived, the woman had recovered.  My brother was watching TV when the lights went out.  I haven't gone to the museum since I was on holiday.  I have been writing letters since nine o'clock.  He was very ill, so he went to hospital.  Why don’t you walk in the afternoon?  They didn’t feel happy when they failed the exam.  If I were you, I would do exercise every day.  He isn’t rich, but he is happy.  Would you mind if I open the window, please?  This new bag is mine.  In my opinion, Hala is a polite girl.  Let’s play chess now.  You shouldn’t eat many sweets.  Although they waited for an hour, he didn’t come.  If she hadn’t been ill, she would have gone to school.